Flutter Social » Business FAQs » Profile + Portfolio » What should I include in my Flutter Social profile? What should I include in my Flutter Social profile? Want to make the most of your Flutter Social profile? Read on for a stunning example and some helpful tips to help your business stand out to your ideal clients. To make it easy to follow along, our descriptions cover the example profile (by With Love & Embers in Philadelphia, PA) from top to bottom. Choose a profile pic that makes a great first impression - it will show at the top of your profile, in our recommendations to couples, and throughout the site. A logo or great professional photo are both good options. Let em know where you're at! Your primary and secondary service areas will show at the top of your profile and will be used to match you to potential clients. We know pros have mixed feelings about sharing their pricing before an initial meeting, but we also know that pricing is one of the biggest things couples are looking for, no matter how big the wedding budget. Include your price points ($-$$$$) to eliminate some of the guesswork, and a specific range if it make sense for your business. Organize your work into galleries to help potential clients get a sense of your business and offerings. 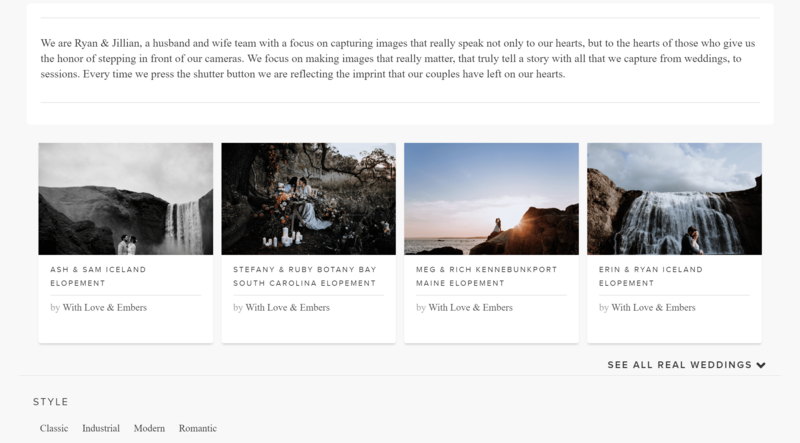 Images from your galleries will be included in our recommendations to couples, so be sure they represent your best work. We recommend at least 4 galleries since your profile can fit 4 across. A great bio isn't easy, but it can go a long way in resonating with your target clients. 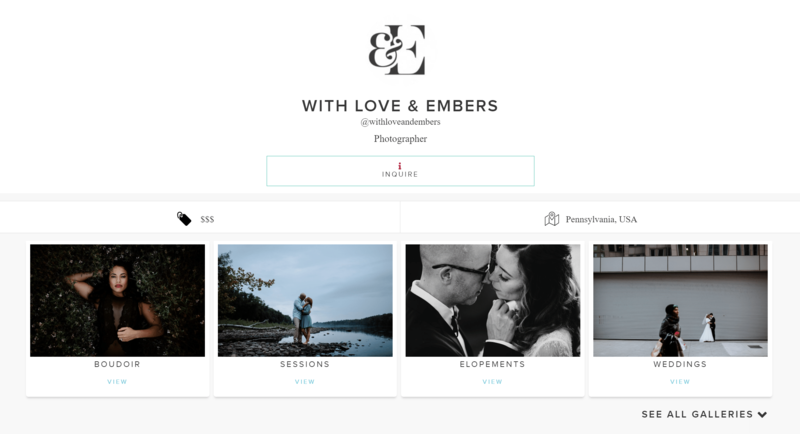 Keep it brief while still giving your potential clients insight into your brand story, like With Love & Embers' bio above. 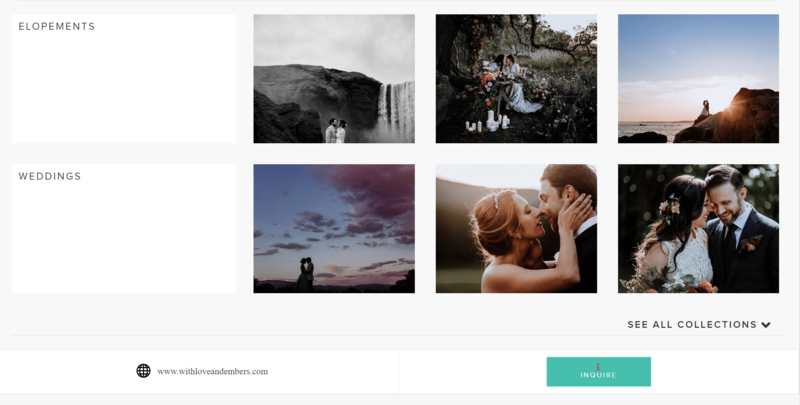 The Real Weddings that you share or are tagged to by collaborators on Flutter Social will appear in your Real Wedding portfolio. Real Weddings go a long way in showcasing your work and the network of clients and pros you've worked with. We recommend adding at least 4 Real Weddings to start since your profile can fit 4 across. Connect with like-minded couples by sharing what styles resonate with you and the values behind your brand. This info will appear in your profile and we'll use it to match your business with potential clients. As your portfolio grows, organize your Real Weddings into Collections to help couples navigate your work and better understand your business. Collections can be organized in any way that makes sense for your business, like locations, venues styles, etc. If you're anything like us, you've poured endless hours and your heart into your website. Make it easy for them to find it. Not only are your Preferred Partners displayed on your profile, they help get your business recommended to potential clients who are a good fit. When a client books with a business in one service category, their Preferred Partners are prioritized in our recommendations in the remaining service categories the client is looking for. Happy clients are the best source of referrals and social proof. When a client marks your business as booked, you're added to their Booked Vendors list on their Flutter Social profile, and they're added to your Booked Client list on your profile. In addition, we'll prioritize your business when making recommendations to couples in your booked client's network.